My friend Sharry suggested, after reading the more literary bits on the first page, that I blog a bit about the planning we put into the trip, the gear we are using or will use, facts about the route or the river and so on. I agreed that it would appeal to some readers, and that I had never really thought about that aspect as being part of this. But since I can segregate it in a different page, that might be a good idea–thank you Sharry! Planning; hmmmmm. The Hales have never been big into planning–that’s why we never had an investment account until Tom was 49 years old. And the first thing he told our investment planner was that he wanted to retire at 55. Hmmmm. Well, the Mississippi River cycling guide is a really good tool. 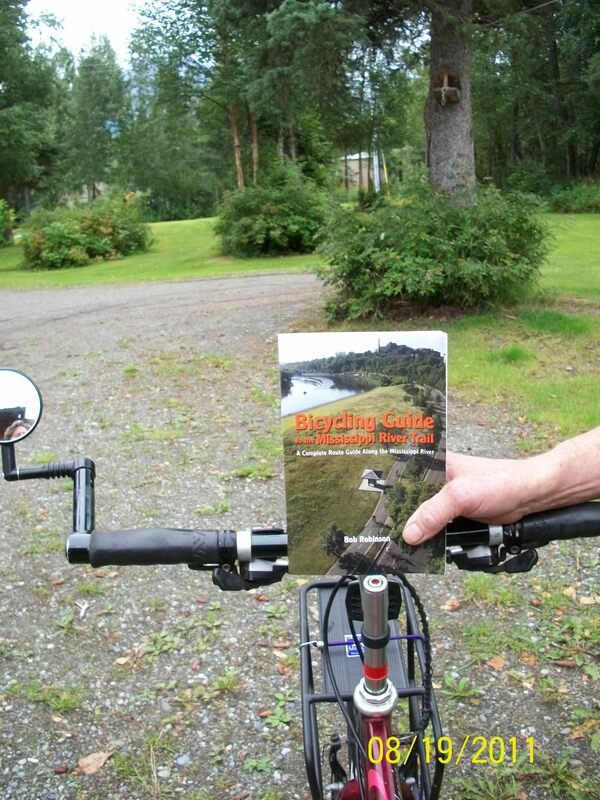 Bicycling Guide to the Mississippi River Trail is a slender book that combines narrative, mile by mile ride logs, maps and lists of campgrounds, lodging and bike shops for the entire route, on both sides of the river. It is divided into sections anywhere from 75-100 miles long. Also included in the narrative are “must see” attractions along the route that might otherwise be inadvertently passed by. Like the giant pink elephant with horn rimmed glasses to be found in McGregor Iowa. It has very little information about the terrain it passes through however, and believe me, if you think it’s flat while driving in a car, you can count on it being challenging on a bike. I’d appreciate a bit of a guide about what to expect in the way of hills. There is nothing resembling a mountain pass along the route. However, short steep rolling hills can be far more discouraging than riding Thompson Pass out of Valdez, a 7 mile pull at 7% grade. I suggest an addition to the next edition! I have made a detailed plan of the first two weeks, even making reservations at public and private campgrounds for the first several days. We plan on going slowly at first in order to get our road legs together–30-40 miles per day. That will give us plenty of time for a beer, lunch, a rest and time in the evening at the campground. From Lake Itasca to La Crosse, Wisconsin should take us about three weeks, as we will stop to see Carrie and then again in La Crosse for a few days. We may even arrive in time for Oktoberfest in La Crosse! After that we’d best be rolling along a little faster or we won’t make our Halloween date in New Orleans. But the ride is so much more about the journey than it is about the timetable! We have friends and relatives all along the way, and there are definitely places we will want to stop and explore–Beale Street with Annie in Memphis, Cape Girardeau MO with Judy, the St. Louis Arch and many more that we will discover along the way. We have new friends to make and old friends to visit and a whole new geography to get to love! Well! We better get rolling!